I’m hosting my first MeetUp tonight. I officially registered the N. Delaware 3D Printing MeetUp with MeetUp.com. I even named the members Enthusiasts. Since Delaware Libraries introduced 3D printing services a couple years ago I’ve met a lot of people in Delaware involved in some way with related technologies. I know them and they know me, but I’ve found they often don’t know of each other. I’m trying to bring them together to, well, meet up. 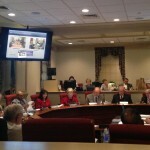 The first meeting will be at the Newark Free Library. I find it ironic that public libraries have served as places for people to meet others with similar interests for years, yet due to its growing popularity, I’ve been able to gain much more exposure and membership momentum by registering this new group with MeetUp.com. My hope in gathering Enthusiasts is to increase collaboration across professions and communities, bring interested Delawareans to a neutral location to discuss how 3D printers have changed their lives. What brand of desktop 3D printer do they have at home? What do they use at work? For what purpose do they use it? 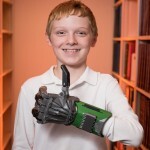 How is 3D printing being introduced in schools? Libraries across the world have been impelled to offer 3D printer services. Yet staff have been challenged by the amount of attention and maintenance required to keep our printers working in the libraries. Delaware’s libraries need community support to increase the success of these printers, to keep them running so anyone can place a request and witness their first print made. As more and more people are purchasing personal devices they too will require a community support network to figure out what they really brought into their homes. What is a ‘hot end isolator’ and where can I find one? How often am I supposed to ‘season’ the nozzle? Hopefully, Enthusiasts from the N. Delaware 3D Printing MeetUp will be able to answer these kinds of questions for each other. Tonight’s meeting will be at a public library. Maybe the next meeting will be at a school, an engineering lab, or a 3D printer shop. Most important are the people coming together to create a community of practice around 3D printing and related technologies. Delaware libraries that offer 3D printing services can be found on the Unleash Inner Genius LibGuide. A couple months ago I was invited by one of my colleagues to a small gathering at the Wilmington Public Library to strategize ways to leverage the library’s 3D printers to help patrons with visual impairments. This had been an interest of mine, since the spring of 2014 when I first introduced a 3D printer and print to a member of the Delaware Library Access Services Friends Group. Apparently it is one of Carl Shaw’s interests as well. As the Inspiration Space Coordinator for the Wilmington Public Library, Carl has the fortune of working with a variety of library patrons, including Derek Alexander of the Delaware Division for the Visually Impaired (DVI). Carl and Derek experimented with some of the video recording and editing tools available to them at the Inspiration Space (such as a green screen and DSLR camera) to create a short video in which they discussed some practical applications for 3D printing to help the visually impaired. Please view their video by clicking here: 3D Printing for the Visually Impaired: Inspiration Space-Wilmington. 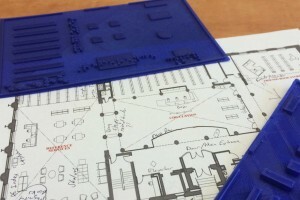 Together they came up with the idea to print a tactile map of the library. Using the floorplan provided in a brochure, we created a basic electronic map comprised primarily of solid black lines and rectangles. 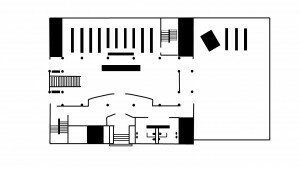 We opened the floorplan in Microsoft Publisher, traced the shapes that represented the reference desk, bookshelves, elevators, and other features that we thought would be relevant to someone using the map as a library way finder. Through a couple of electronic file conversions using software such as Inkscape and the online 3D modeling application Tinkercad, we created a series of .stl files – a format commonly recognized by 3D modeling software. Our first iteration has proven promising. 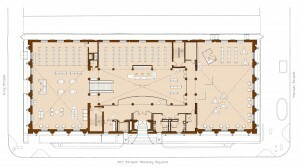 We have a couple of prints, focused on the first floor Reading Room and Reference area. We are working with our contacts at DVI to figure best practices using braille to identify features such as the elevator. The next challenge will be how to best represent the open stairway that leads down to the Teen and Children’s areas. Please check back for future updates on this project. 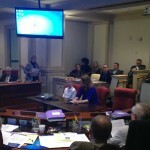 We are so thankful for all library supporters, including the Consavage family of Claymont, who spoke at the Joint Finance Committee hearing on February 3rd. 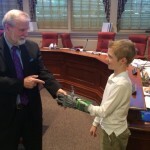 After Clare and Colin Consavage told their story about 3-D printing Colin’s prosthetic hand at the Wilmington Public library, they received a standing ovation from legislators! Transformational stories like this are truly what the library is all about. Read more about Colin and his family or watch an ABC or NBC news video of their story. To kick off Teen Tech Week, The Delaware Division of Libraries is partnering with Zip Code Wilmington and the Barrel of Makers to bring Robocode to the Brandywine Hundred Library. Instructors from Zip Code will guide 25 teens in a day-long workshop and programming game where teens will learn the basics of coding software by building their own virtual battle tank. Each participant will walk away with a solid introduction to Java, one of the world’s most in-demand programming languages. Teens aged 14-18 are invited to participate in Robocode. Please register in person or call the Brandywine Hundred Library, 1300 Foulk Road, Wilmington, 302.477.3150. 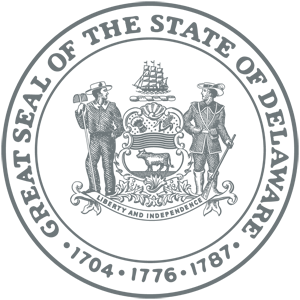 Teen Tech Week is sponsored by the Young Adult Library Services Association (YALSA), a division of the American Library Association. During this week libraries throughout the state of Delaware will showcase the great digital resources and services that are available to help teens succeed in school and prepare for college and 21st century careers. 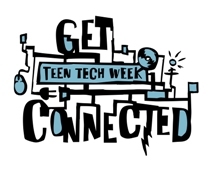 Contact your Delaware public library to learn about more opportunities to participate in Teen Tech Week.